Progress Oberiko is a corps member who shared a very touching story via her Facebook page. 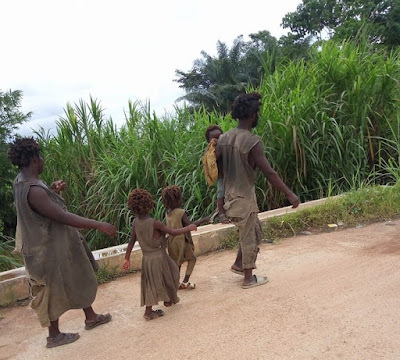 This has to do with an inseparable family of 5 battling mental illness in Ogoja, Cross River State. According to Oberiko,the family has a very effective way of communication, adding that the family are never separated and are always seen walking together. tried, they either walk past too quickly, change direction, or not just close enough. At other times I may be on a bike and whenever I ask the cyclist to go slow so I can get a shot of them, he'll be like "Hmmm, Abeg o, I nor fit stop this bike make u snap o, if the madman catch u, your own Don finish! And that's how it went. The first time I saw them here in Ogoja, my heart melted, I was livid. And my mind wandered, searching for the closest guess as to why a whole family, husband, wife, and three beautiful children would be plagued with INSANITY. My heart could not contain the curiosity, then i began to ask questions. Anytime I drove past them in a car or on a bike, I engage the driver or someone in a conversation about them. I have seen them trekking long distances under the scorching sun?, I've also met them in the market making enquiries about where they could get a particular item to buy. They're never separated, always found walking together, complete family. But the intriguing part is their communication. Jeez! This "MAD" family speak CORRECT QUEENS ENGLISH. They flow in CLEAN grammar. Na this one dey burst my head ? I've heard the man instructing one of his children who was walking sluggishly behind him as they trekked down the road; "Hey Dorcas, will you hurry up, C'mon girl, meet up with the pace". And I marvelled. At the market he asked someone for directions and he went; "Hey ma'am, Pls where can I get this and this... "
As you can see their dreadlocks is twisted, showing that it has lasted for God knows how long ? This means that this madness nor be today. E Don tay! A conversation ensued between him and his wife one day and it turned into an argument, people were listening; you'll be so shocked when you hear what the content of their argument was?..